If you have decided that the best climbing tree stand is what you intend using for your next hunt, then you should prepare a tree stand harness to protect you while using the treestand. The harness for your tree stand is very important when you are hunting. Making your tree stand firm enough to withstand different external forces is enough if you do not consider falling. The tree stand must be firm enough to hold your weight, including your equipment and other accessories, and ensure you get the perfect view you desire. One thing we should all consider is the possibility of the treestands falling from the tree. This would definitely not be a pleasant experience, but preparation for it would ensure that you are safe and experience a minimal amount of injuries. The main reason for a treestand harness is to ensure that you do not fall in times of tree stand failure and other factors that might cause one to fall. The point is that the harness is worn like straps on the body, and it is attached to the tree. So if there is a possibility that you might fall, you would be held in place by the harness. The harness is very important and you would require proper knowledge of how to put it on before you should use it. It must not be too tight to prevent injuries, and it must not be too loose to prevent slipping out. 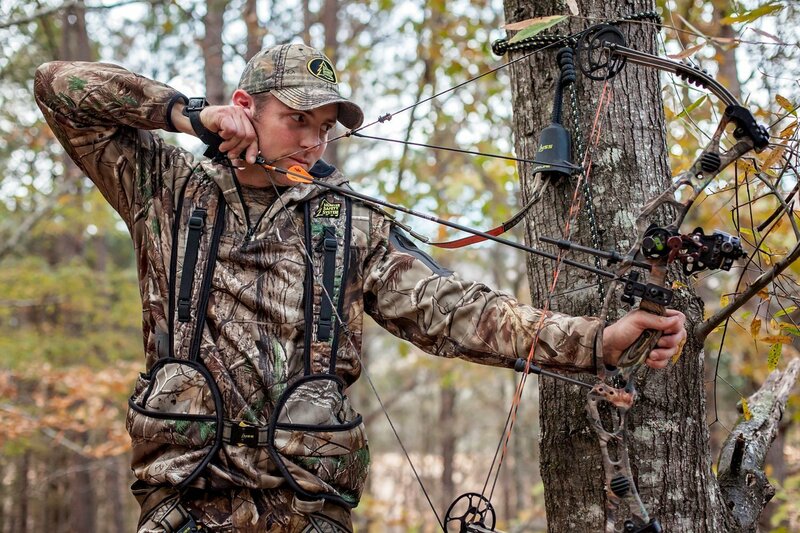 How to choose the best treestand harness for bowhunting? This harness is one that you can confidently beat your chest for as a sign of assurance of safety. It is light, comfortable and provides extra insurance from damages gotten from falls. It is fast to use and consists of shoulder and leg adjustments that can all be controlled from one point. The tree spider speed harness is the only harness that has this feature. This feature allows you to use the harness with the Scentblocker jacket. So you do not need to take off your jacket or the harness just to wear any of the other. The tree spider speed harness is designed with a shock absorbing bungee tether that helps to reduce the effects of sudden jerks gotten from falls. It also comes with a vertical climbing loop, and this feature with the bungee tether is one of the reasons the tree spider speed harness is of the most unique in the market today. 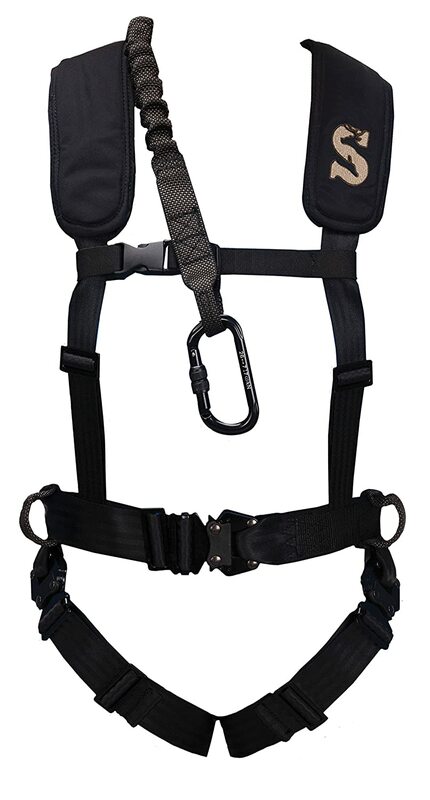 The tree spider speed harness is designed with a chest adjustment strap and a YKK buckle. It also comes with a shoulder strap and leg adjustments that have two venom leg buckles. 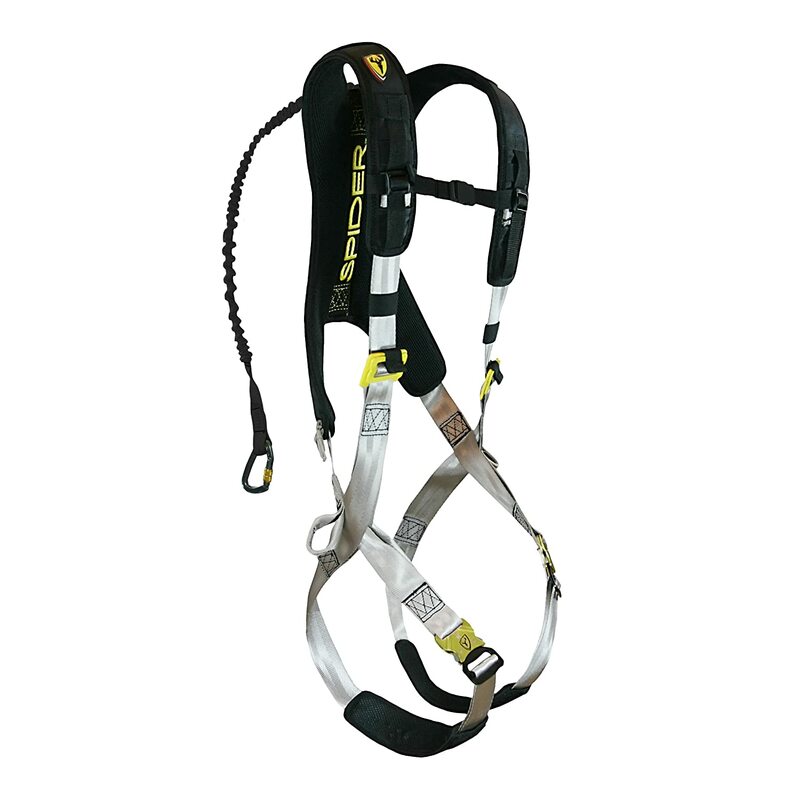 The tree spider speed harness is a 7.2-ounce harness with a dimension of 16 by 11.5 by 4 inches. It is designed with a Powerlink aluminum carabineer, an adjustable tree strap, a suspension relief strap and a safety DVD. It has an Ario mesh back that is combined with X-web fit that enables you to move with the harness still on and with maximum comfort. The Hunter safety system ultra lite flex is a flexible and lightweight harness that consists of a series of hexagons that are individually padded to provide a comfortable and snug fit when worn. It is very flexible, and it consists of 1.25 inches of an upper-body webbing, waist buckle, and tether that work together to provide the remarkable strength the hunter safety system possesses. The hunter safety system is one of the lightest tree stand harness you can find in the market today. It is designed solely to possess flexibility and provide the best of comfort you can get. If you are worried about a lightweight harness being the only protection you have from falling off of a tree, then you should worry no more because the hunter safety system harness is a tried, tested and proven device that eliminates the dangerous dangling straps and weave-through buckles. It also comes with a secure mesh cell phone pocket. The hunter safety system comes with a lineman climbing strap, an adjustable tree strap, a suspension relief or deer drag, an instructional DVD and safe-use instructions. All these to ensure that all the possibilities of an accident occurring is ruled out. The hunter safety system is a 5-pound tree stand harness that is designed to meet all the needs of a lightweight harness, yet providing strength to prevent accidents from affecting the user. It has a shock absorbing tether and a waist buckle that reduce the weight and bulkiness of the harness. 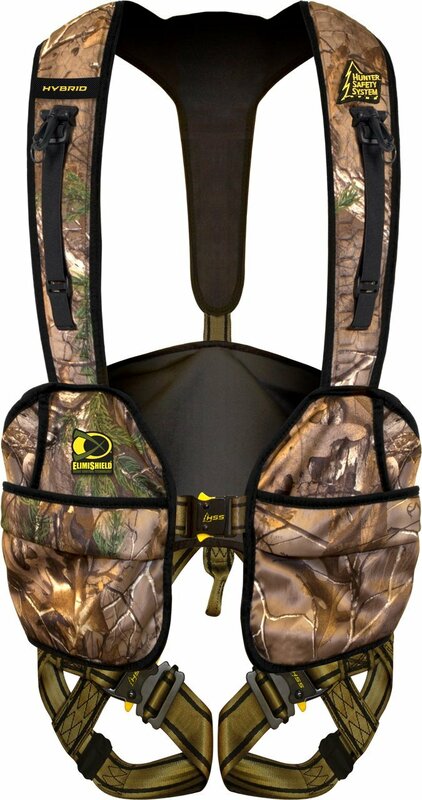 It is designed in a way to be the lightest weight tree stand harness in the market today. Bear in mind that it has been tested for efficiency and so it can be relied on. Aside the instructional DVD and other safety measures provided, the hunter safety system has a five-year warranty to boast if its efficiency. 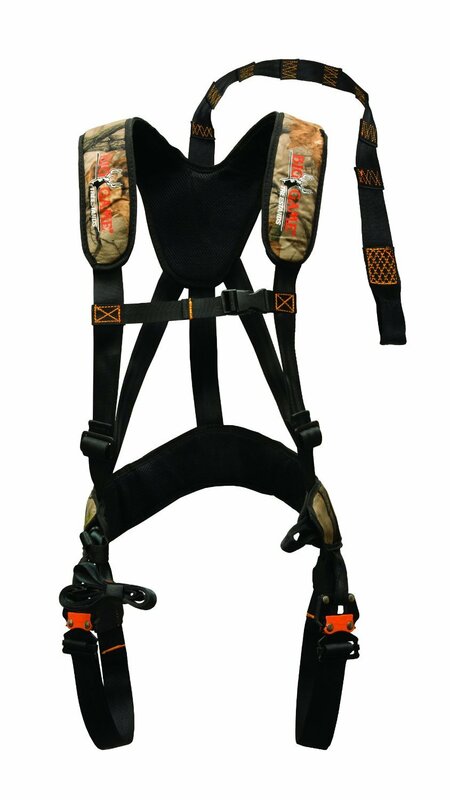 The hunter safety system bowhunter harness is one of the latest and most affordable tree stand harness. It eliminates all forms of dangling straps that can cause accidents, and also does away with confusing weave-through buckles. It is very lightweight and weighs just 2.5 pounds. The lightweight is to provide comfort and ease in mobility for the user. One of the remarkable features is that it is a very quiet harness that is not affected by temperature. This is what a harness is supposed to be doing; assuring the user that his safety is guaranteed. The hunter safety system bowhunter harness is doing well to ensure that the safety of its users are accountable for by eliminating dangling straps and weave-through buckles. The hunter safety system bowhunter harness is a versatile harness that can be used repeatedly for a long period of time. It can be worn over light clothes and over heavy winter clothes and gear in order to be usable all season long. A feature that marks out its relevance strongly and also gives it an edge in the harness market. The hunter safety system bowhunter harness comes with a lot of accessories which all work with the entire harness system to ensure that the best is given to the user. Some of the accessories present include a primary treestrap, a suspension relief strap, safe use instructions and DVD for safety. The hunter safety system bowhunter harness is a lightweight harness with a dimension of 13.5 by 12.8 by 2.5 inches and weighs roughly 3 pounds. It is a very safe harness with the absence of dangerous dangling straps and weave-through buckles that are confusing. It is very light in weight, making it easy to provide comfort and easy mobility for the user. One special feature is its versatility; this means that it can be worn all season long and still function properly. The Big Game Ez-On Basic Safety Harness is a comfortable tree stand harness that comes with paddings on the shoulder to reduce the harsh effect of the harness on the shoulders. One of the things most hunters overlook is the comfort the harness provides. They focus on the durability and all other features that deal with strength but ignore the fact that they would have to wear the harness for a very long time. Wearing a harness for a long time would require that the harness is as comfortable as can be. The Big Game EZ-On Basic Safety Harness is one of the few treestands harnesses that assure the user of a high level of safety. The harness possesses a tree belt, a lineman’s belt and an SRD strap, which all work together to ensure that the user is secured to a very high degree. The Big Game Ez-On Basic Safety Harness consists of a quick release buckle on the leg straps that enable the user to remove and adjust the buckles easily. Removing the buckles and doing it with speed is something that an ideal harness should possess, and the Big Game Ez-On Basic Safety Harness is doing well to show that it is not lagging behind in that aspect. Some harnesses are usually a lot of trouble to put on or to even adjust, and this is a really big turn off for the user. A remarkable feature of the Big Game Ez-On Basic Safety Harness is that it fits most people, regardless of their body size or type. One of the key features of a harness is that it must fit the user properly before being considered as safe. The Big Game Ez-On Basic Safety Harness is adjustable to enable it fit most types of people, and this comes in handy so you don’t have to walk through the entire store looking for the right fit. The Big Game Ez-On Basic Safety Harness is a 12.5 by 11 by 3 inches harness that weighs about 2 pounds. It comes with a built in deer drag and can lift up to 300 pounds of weight. 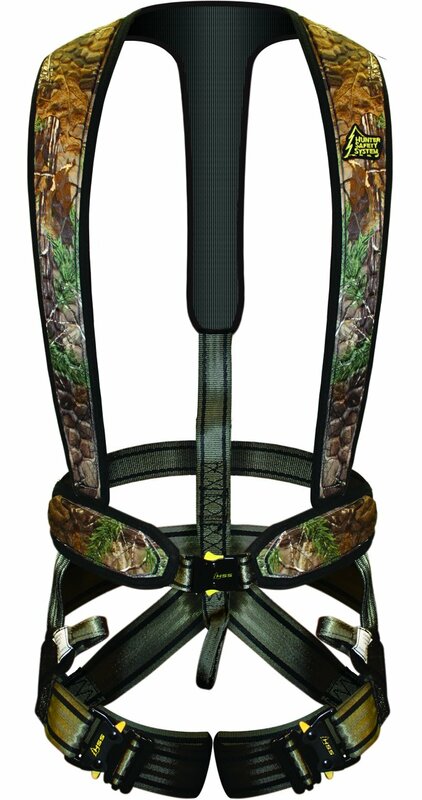 The Summit Tree stand Men’s Sport Safety Harness is a harness that has a reputation for keeping you comfortable and protected on your treestand. It fits securely and provides a very high level of comfort that would keep you safe and in your tree stand for a long period of time. It comes with shoulder straps for added comfort and a performance tether with quick-lock buckles. All these features are to ensure that the Summit Tree stand Men’s Sport Safety Harness is the perfect harness for the job. The Summit Tree stand Men’s Sport Safety Harness comes with a lineman’s climbing rope as an added accessory to ensure that you can climb the trees safely while you are installing your tree stand, safe line or any of your other hunting gear. The lineman’s rope is a reliable rope, and you can be assured that you safety is guaranteed. The Summit Treestand Men’s Sport Safety Harness is one of the few treestand harnesses that are produced with the finest of materials. It is made with top quality materials that are fully functional and ready to be used for hunting right out of the box. It is a completely adjustable harness that is has a full body arrest system that ensures that it fits the body securely. The Summit Treestand Men’s Sport Safety Harness is a high-performance harness that comes with a lineman’s rope. It possesses quick lock buckles and padded shoulder straps engineered for comfort. It is very strong and can carry up to 300 pounds of weight. The Hunter Safety System Hybrid Flex Harness is a jacket-like harness that provides comfort and flexibility either in or out of the stand. It has a shock absorbing tether and waist buckle that reduces the effect of impact. One feature that has been on the tongue of most hunter is a harness that is very light in weight. The Hunter Safety System Hybrid Flex Harness has done well to provide this feature for its users. Since the Hunter Safety System Hybrid Flex Harness is very light in weight, it is expected that it should be at least comfortable. It also comes with a number of padded hexagons for added comfort. The Hunter Safety System Hybrid Flex Harness is a 16 by 14.5 by 3 inches harness that is just about 2.5 pounds. It is a harness that offers comfort, durability and versatility in one package. It is made of remarkable quality materials and has a 5 year warranty. The Hunter Safety System Treestalker Safety Harnesses is one of the lightweight harnesses in the market that is made with premium quality and is affordable at the same time. It is very versatile and can be used all season long. 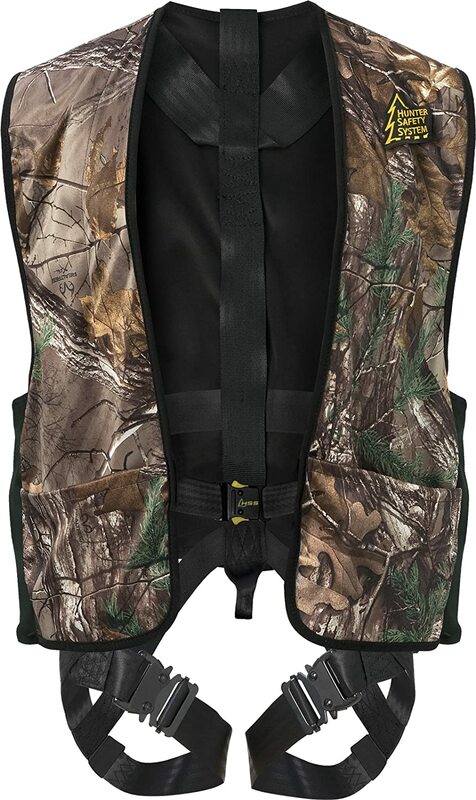 The Hunter Safety System Treestalker Safety Harnesses is a very comfortable harness that has right fit zones to keep the vest tight and eliminate every form of unnecessary bulk. It possesses leg straps that are adjustable to fit over clothing. The ability to absorb shock is one remarkable feature of this harness. It is made with a 1.25 inch thick tether that can absorb more shocks than expected. The Hunter Safety System Treestalker Safety Harnesses is a 15.8 by 14.5 by 3 inch jacket that weighs about 4 pounds. It comes with a lot of accessories and is designed to offer comfort and durability at the same time. Choosing a tree stand harness is something that you should have a conviction of getting nothing but the best. Cheap materials would not just do, and they can cost you your health if not your life. Cheap harnesses would only ensure that you fall faster and might not offer much of protection since your weight and that of the tree stand are held on the tree. The tree stand might not be designed strong enough to carry weight for long, and even if it is, you must ensure that you are protected from falling. the ability of the harness to withstand sudden shock or forces is one of the ways to grade it as durable. Falls happen unexpectedly and would cause a large amount of force on the harness and your weight. This is why you have to ensure that your harness is of high quality and also ensure that it fits you properly. Double to check to ensure that the harness is made out of quality materials that are known to be strong enough to withstand sudden shock that would occur if you fall all of a sudden. One thing to note is that a tight harness can lead to cuts during accidents, and a loose harness can cause you to slip right out. one of the few things people do not consider when purchasing a harness is the comfort. You should be reminded that you would be wearing for a very long period of time, and any form of discomfort can cause you more harm than good.So ensure that you purchase a harness that is made with top quality materials in both durability and comfort, to ensure that you do not get frustrated from wearing the harness that is meant to protect you. the type of harness that would completely ensure your safety is the full body harness. Some harness comes with utilities like pockets which can come in handy when you need some rounds close to your reach. Using a tree stand harness is one of the most important aspects of tree stand hunting. You must bear in mind that you have a family or number of loved ones you are returning to after the whole hunting expedition. So your safety should be of utmost priority. One way you can ensure your safety is by wearing your tree stand harness even before you leave the ground. This is to ensure that you do not forget to put it on when you climb unto the treestand. To use a tree stand harness properly you have to ensure that it fits you perfectly. Not too big or too small, but one that would fit you perfectly. This is because a tight harness would only cause you to experience pain during accidents. It offers protection well but causes serious injuries through cuts. These cuts occur due to the tension applied to the skin when the body is hanging freely from the harness in times of accidents. Does this mean that wearing a bigger harness is the solution? Certainly not. A bigger harness only makes matters worse. In times of accidents, there is a very high probability that you would not be held securely by the harness and there is a higher likelihood that you would slip right out of the harness when the accident occurs. Wearing a harness that is your exact size enhances the grip of the harness on your body and ensures that there are no loose points that might cause you to slip out of the harness. Some might say that wearing your exact size harness might not be comfortable. To address that, bear in mind that there are different harness brands in the market. Each of these brands offers different products with peculiarities, and some are designed to offer more comfort than protection. So you do not need to worry about what the harness would do, but how well it fits you. It is expected that you get the right size; one that fits you perfectly, to avoid accidents happening during an accident. Your safety is the most important thing, so ensure that you take the right and appropriate safety measures to ensure that you return home safely to your family and loved ones. The best tree stand harness should be based on the standard specifications of a tree harness. The Big Game EZ-On Basic Safety Harness is the best of the seven. It offers all the necessary features ofthe harness, and the price is one that is in tune with the specifications it has.